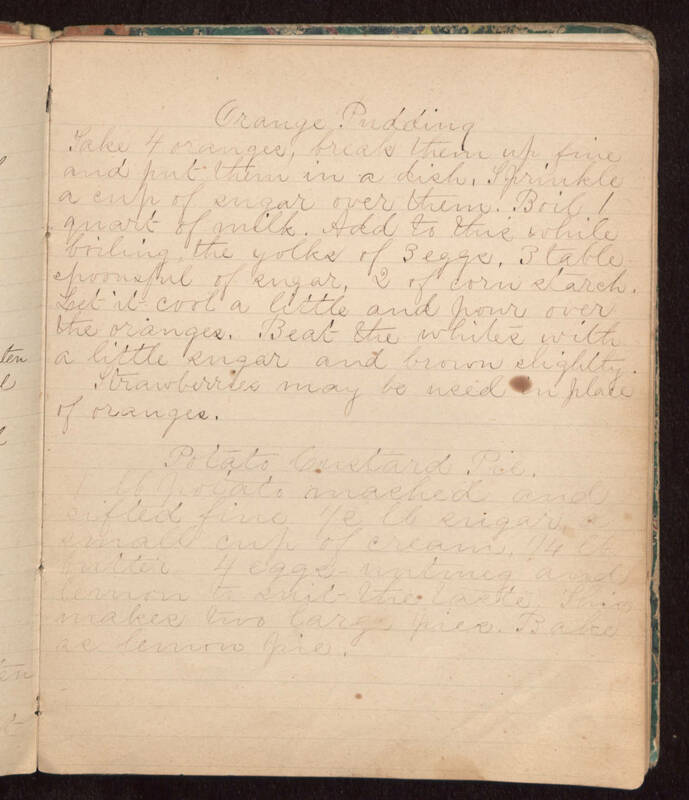 Orange Pudding Take 4 oranges, break them up fine and put them in a dish. Sprinkle a cup of sugar over them. Boil 1 quart of milk. Add to this while boiling the yolks of 3 eggs, 3 tablespoonsful of sugar, 2 of corn starch. Let it cool a little and pour over the oranges. Beat the whites with a little sugar and brown slightly. Strawberries may be used in place of oranges. Potato Custard Pie. 1 lb potato mashed and sifted fine 1/2 lb sugar, small cup of cream, 1/4 lb butter 4 eggs - nutmeg and lemon to suit the taste. This makes two large pies. Bake as a lemon pie.